ZEBRA / TIGER STRIPE BRACELET ... These Wild and Fun Tiger / Zebra Stripe Bracelets / Ponytailers will be great to wear for any activity. 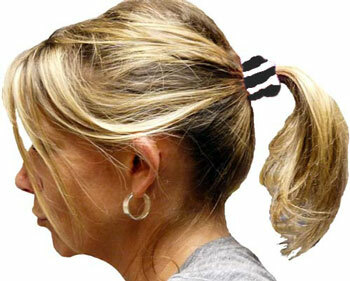 Red Lion Brand Zebra Stripe Bracelets / Pony Tails go great either worn as a Bracelet or as a holder for your Ponytail. Animal Stripe Bracelets / Ponytailers are Sold (2) per Package (one pair). Zebra / Tiger Stripe Terry Cloth Bracelets / Pony Tailers measure aprox. 1" tall x 3" wide (they will stretch to about 5" wide), are made of Heavy-Weight Plush Terry Pile Fabric, and feature Knit-In Stripes around the Bracelet ... One Size Fits Most. 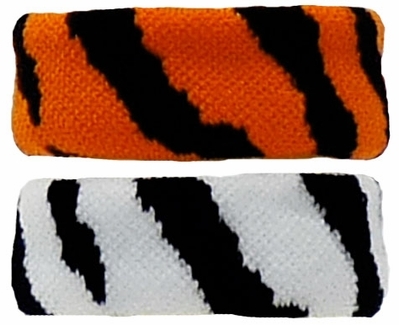 � Orange Band with Black Stripes, � White Band with Black Stripes.